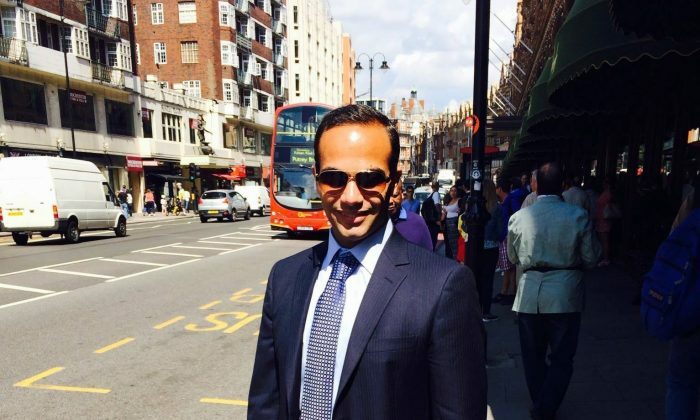 For over a year now, a seemingly chance encounter between George Papadopoulos, a foreign policy adviser to the Trump campaign, and Alexander Downer, an Australian diplomat, has been cited as the sole reason the FBI opened a counterintelligence investigation into the Trump campaign on July 31, 2016. The meeting, however, was not by chance. It was set up through a chain of two intermediaries. The information relayed was limited and, significantly, appears nearly identical to information later contained in the first memo from former British spy Christopher Steele that the FBI obtained in early July 2016. Papadopoulos knew an Israeli Embassy official in London named Christian Cantor, who introduced Papadopoulos to Erika Thompson. Thompson was a counselor to Downer and served in Australia’s London embassy. According to The Daily Caller, Thompson reached out to Papadopoulos in early May 2016 and said Downer wanted to meet with Papadopoulos. The meeting between Papadopoulos and Downer took place on May 10, 2016, over a shared drink in a London bar. “During that conversation, he [Papadopoulos] mentioned the Russians might use material that they have on Hillary Clinton in the lead-up to the election, which may be damaging,’’ Downer told The Australian about the Papadopoulos meeting in an April 2018 article. Downer makes clear in the interview that Papadopoulos did not say what the information was. “He didn’t say dirt, he said material that could be damaging to her. No, he said it would be damaging. He didn’t say what it was,” Downer said. Downer also said that none of the comments from Papadopoulos indicated that Trump had any knowledge of what was being discussed. “Nothing he [Papadopoulos] said in that conversation indicated Trump himself had been conspiring with the Russians to collect information on Hillary Clinton,” he said. Downer, in his interview with The Australian, said that he reported his conversation with Papadopoulos back to Australia. “Well, it was worth reporting,’’ he said. “It wasn’t the only thing we reported. We reported [back to Australia] the following day or a day or two after … it seemed quite interesting.’’ Downer’s conversation with Papadopoulos was reportedly disclosed to the FBI on July 22, 2016, through channels with the Australian government. This version of events appears to be at least partially corroborated by the House intelligence committee, which found that no official intelligence was used to open the FBI’s counterintelligence investigation. “There was no intelligence that passed through the Five Eyes channels to our government. There was no Five Eyes Intelligence Product as it’s been reported. There was no product,” Nunes told Maria Bartiromo in April. This means that neither Australian intelligence nor the Australian government itself alerted the FBI to the Papadopoulos information. What happened with the Downer details, and to whom they were ultimately relayed, remains unknown. Steele had been hired by the Clinton campaign and the Democratic National Committee, through law firm Perkins Coie and opposition research firm Fusion GPS, to produce the dossier containing unverified allegations against Trump. Downer’s background appears somewhat unusual for an Australian diplomat. Downer has long-standing ties to UK intelligence firm Hakluyt, having served on the advisory board of Hakluyt’s parent company Holdingham from 2008 to 2014. Hakluyt’s top officials come from MI6. Several board members, like Sir Iain Lobben, come from GCHQ—the UK equivalent to the National Security Agency. Former MI6 head Richard Dearlove has a number of ties to Hakluyt as well. Downer was forced to resign from Hakluyt’s advisory board when he became Australian ambassador to the UK in 2014. But Downer reportedly maintained contact with Hakluyt officials. “Australian High Commissioner to the UK Alexander Downer had been on the advisory board of the London-headquartered firm since 2008 when he was a UN special envoy but was forced to give up the position when he was appointed to head the Australian diplomatic post in London in 2014,” News Corp. reported on Jan. 18, 2016. Downer, according to the article, had still been attending client conferences and gatherings of the group. Downer also arranged one of the largest foreign donations to the Clinton Foundation: $25 million from the Australian government. In the official version of events, the FBI was informed on July 22, 2016, of the Papadopoulos–Downer conversation. This was the first time Papadopoulos landed on the FBI’s radar. Just over a week later, on July 31, 2016, the FBI opened a massive counterintelligence investigation into an opposing presidential candidate’s campaign based solely on this single conversation—a conversation that differed little from details contained in the June 20, 2016, memo by Steele, which the FBI had already had in their possession since early July.